This is technically the 403rd day of this blog, which – according to my mindset when I started blogging 403 days ago – means that yesterday should have been the last day. But, like David Bowie once said, time may change me, but I can’t trace time (that’s not exactly the point I’m trying to make here, but… you get it). I started this with the intention of blogging every day until December 31, 2013. I made it until March 29, 2013. Then I slowed down and it was a good choice. Things ch-ch-change. Instead of closing up shop, I’ve decided that 402 will persevere until the end of time (or until I no longer have an internet connection or a computer or any lists to write or interesting people to learn about). So in honor of keeping going, I made a list. It’s not a list of 2014 resolutions or pledges. It’s not lofty or necessarily aspirational—it’s just a checklist. Of small things that are do-able every day, like “brush your teeth” or “put on pants.” These are easy. Smile when you wake up (even if it doesn’t come naturally and you’re just moving your face around). Walk around with bare feet. Take a breath of outside air halfway through the day (no matter how cold, rainy, hot or dry it is out there). Admit that you don’t know something. Put your phone away at night. If you didn’t get to it today, let it go. Then do it tomorrow. It’s time for many, many things. For spring, for gay people to be able to marry each other, for everyone to stop using plastic grocery bags and get a couple nice reusable ones (I mean, really…. it’s so easy), etc. After approximately 47 days of thought, it’s also time for me to cut back on blogging. I hate the encroaching notion that I may have to send crappy content into the world just to follow my own blog-every-day rule. So, I’m changing the rule. Part of me (most of me, really) views cutting back as a failure. I didn’t even make it halfway to 402 days. Another, much, much smaller part of me views this for what it really is—a shift in priorities. When I started 402, I had just quit my full-time job to pursue self-employment. I wanted to write, so write I did. Now, 125 days later, I’m up to my ears in contract work that I love, my friends all have adorable babies and puppies that I want to go visit, and I was accepted into the cast of a amazing show that goes up in June. We start intensive rehearsals in a couple of weeks, and I should probably focus on being a happy and sane employee, cast member, friend and human being. All this is not to say I’m quitting the blog. I’m just quitting the every day-ness of it. There are so many incredibly interesting people and ideas in the world, I won’t be able to stay away for more than a couple of days between posts. Rest assured that I will still flood your email inbox and Facebook feed. For now, enjoy a beautiful weekend with someone (or a few people) you really like being around. Share some hugs. Punch some shoulders (lovingly). Day 120: It’s Not Fun! 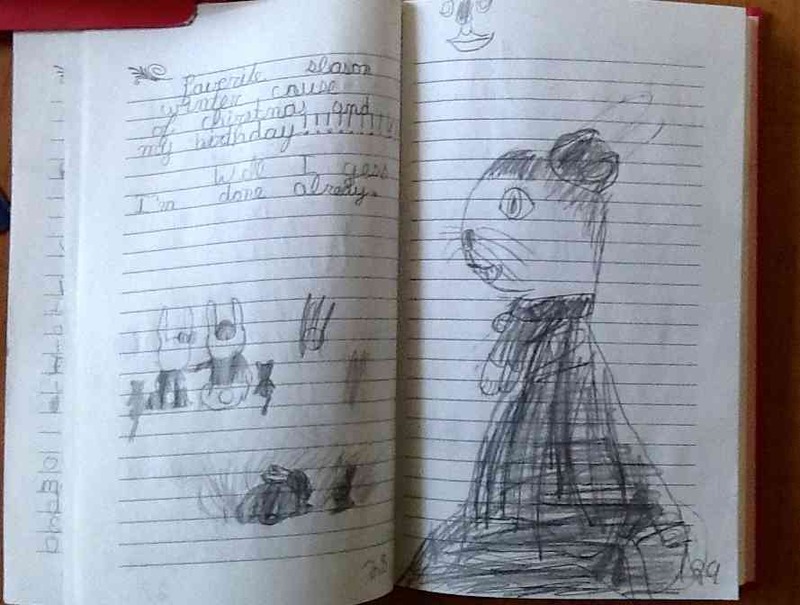 As promised, below are more of my youngest sister’s youthful musings from her recently discovered journal. 1/15/97 Last week and a day was my birthday but my party was only 4 days ago. I think I got my last gift was yesterday, It was the cutest stuffed animal cat. But I wish the gifts would still keep on coming, not that I am greddy or anithing it’s just they make my room briter because my room is where the sun never shines so I at least want my room to be fun so I like my room at all. 3/19/97 Here I am sitting here just wating around for choir to start. I wish my mom didn’t teach conformatoin because if she didn’t teach conformatoin I wouldn’t be siting here wating at all. There go’s a bunch of preschoolers about to go outside, lucky them. But now that I think of it I don’t really want to go outside. From now on this isn’t my jornal anymore it’s my place where I keep my secrits, in other words my diary! 4/23/97 Yesterday my mom said that we could go bike riding! But since me and my sisters were fighting we couldn’t go. So everyone started blaming me for it (they say I’m a tattletale.) I told my mom what they said and she said in a loud angry voice, “That’s exatly why I didn’t let you go on the bike ride, I don’t want you to be mean.” I said, “I’m trying not to be mean,” then I started to cry. My mom said “I know you are, I only said that because I love you.” Now I feel much better. More of my sister’s birthday thoughts + a drawing of a human/rabbit with a bun. I started dating a guy (not from the Internet, although I do think he would appreciate my burning gingerbread house profile picture) who likes reading my blogs out loud to me. It’s a sweet but strange experience that makes me painfully aware of my tendency to use awkwardly long lists and excessive qualifiers. In general, I don’t feel necessarily competitive (I was more of a “social athlete” in college), but I did feel a little “Oh-no-she-isn’t” twinge kick an extra beat into my heart. Three funny blogs in, I asked him to please go back to reading mine out loud instead. Days later, I’m trying to figure out what stirred in me. Was it blog envy? Some kind of primal urge to mark my digital territory? Could I have been jealous of her humor prowess? One of the wonderful things about blogging is that everyone can do it, regardless of how “good” they are. Any 13-year-old with public library access and a dash of tenacity can scoop up some online earth to call their own. So, I’ve always been comfortable knowing there are bloggers out there who are funnier, smarter, deeper, more cultured and more well-read than I am (even some of those 13-year-olds). They challenge the rest of us to be better writers. As this post is read aloud to me, I’ll listen quietly and dig deep into my soul to source the cause of my discomfort. I’ll also try to use more metaphors.